Henry Street Garda Station, Limerick. GARDAÍ ARRESTED THREE people after searches where a growhouse, cannabis worth €10,000 and a loaded pistol with a silencer were discovered in Co Limerick. The two men arrested were aged 61 and 29, and the woman was aged 32. The 61-year-old man and the woman have since been released without charge, while the 29-year-old has appeared in court this evening. Gardaí were carrying out searches in Newcastlewest on Thursday when a quantity of cannabis with an estimated street value of €10,000, a loaded pistol with a silencer, and a grow-house with supporting paraphernalia, were seized. The searches were aimed at targeting organised criminal activity in Limerick. 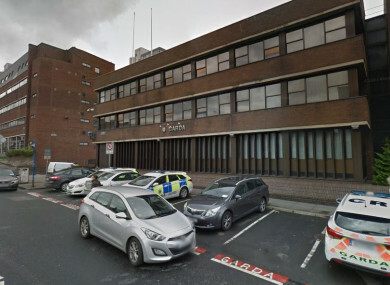 All three people were arrested at the scene and had been detained at Henry Street Garda Station. The 29-year-old man was detained under Section 2 of the Criminal Justice (Drug Trafficking) Act, 1996 and the 61 year old man and 32 year old woman were detained under Section 30 of the Offences Against the State Act. The 61 year old male and 32 year old woman have since been released from custody without charge, pending submission of a file to the Director of Public Prosecutions. The 29 year old male has been charged and has appeared before a special sitting of Limerick District Court at the Court Buildings, Mulgrave Street, Limerick, at 5pm today. Email “Two men and woman arrested in Limerick after cannabis, loaded pistol and silencer seized”. Feedback on “Two men and woman arrested in Limerick after cannabis, loaded pistol and silencer seized”.